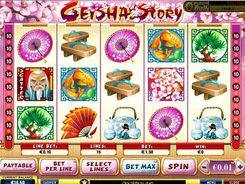 Geisha Story is a video slot with 5 reels and 15 win lines. Its symbols and design live up to its name and a Japanese theme. The reels smothered in sakura blossoms contain the symbols of Geisha, Samurai, cherry blossoms, tea pots, wooden shoes, parasols, etc. 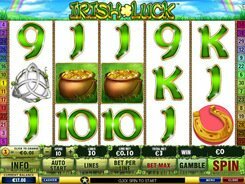 The bet range per payline is $0.01–$1, with a maximum of 10 coins per line making it the top wager of $150. 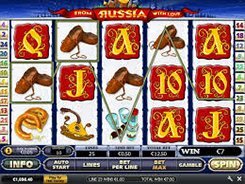 Playing at highest stakes you have good chances of getting the fixed jackpot. The grand prize of 10,000 coins is paid out for five samurais on any enabled line. A samurai is the wild sign that substitutes for other symbols to form winning combinations. The scatter is represented by the Master symbol. Three, four or five wisemen increase your total bet by 5, 10 or 50 times. 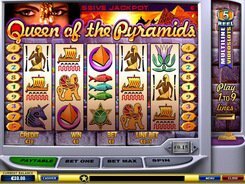 Geisha appearing on reels 1 and 5 present you a pick-type bonus game. In the Geisha Girl Bonus round pick one of five fans and receive free spins with various multipliers. 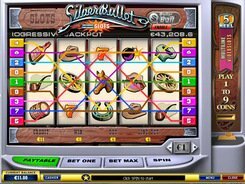 The online slot is a part of the Dollar Ball progressive jackpot network that is available in some of Playtech games. First of all, you need to activate the feature by clicking Enable in the upper right corner of the screen. To get the progressive, you must choose five out of 49 numbers. 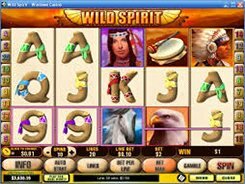 All the five numbers of your choice should match the numbers selected by the slot machine. PLAY FOR REAL MONEY!